Triton is the biggest of Neptune’s thirteen known moons. This moon is suspected to have been captured by Neptune, which would explain its highly unusual orbit and rotation. One of the only bodies in the solar system to have a retrograde orbit, Triton also rotates at an angle of 157° to the axis of Neptune’s rotation. This means that the poles and equator alternately face the sun during rotation, most likely causing dramatic changes in seasons. When the Voyager 2 flew by in 1989, Triton’s South Pole was facing the sun. An ice cap of frozen nitrogen and methane was found on Triton’s South Pole when Voyager 2 visited. On this page is a 4MB movie available. a simple seasonal model having a hemispheric response delay relative to solar forcing of 30 years (73% of a full season). the rate of change is an additional factor of 165 slower. the near-IR results discussed in the previous paragraph. number was observed (sunspot data from ftp://ftp.ngdc. 1960 seem inconsistent with both seasonal and solar responses. resolution of this discrepancy remains to be found. at 467 nm for almost another two decades. Maybe someone can find a way of taking some of the images from this PDF. Some could be handy later on. Previous investigations of sputtering of molecular nitrogen from Triton's atmosphere lead to estimates of escape rates of about 1021 N2 molecules s−1. Here, the erosion of Triton's nitrogen atmosphere resulting from sputtering due to different plasma populations and particles from Neptune's magnetosphere is investigated. This investigation shows that sputtering from Triton's nitrogen atmosphere could lead to N2 escape rates during the plasma sheet crossing on the order of 5 × 1024 s−1. This calculation shows that sputtering of Triton's nitrogen atmosphere by magnetospheric particles is an efficient nonthermal escape mechanism, similar to Saturn's large satellite Titan, and is an additional important process for the power input of the Neptune aurora. The N2 escape rates should be in a good agreement with the measured H+/N+ ion ratio in Neptune's magnetosphere. The excess energy of the sputtered particles leads primarily to escape and supply to the Neptune system rather than to ballistic orbits. Sputtering will yield, however, a small N2 corona on Triton. Laboratory data is needed on electronically-induced desorption from low-temperature solids: ices, organics, hydrated salts, glasses and certain minerals. Many bodies in the outer solar system are bombarded by relatively intense fluxes of fast ions and electrons as well as solar UV photons. This can cause both changes in their optical reflectance as well as desorption of atoms and molecules from their surfaces. Stimulated desorption produces Na and K 'atmospheres' above the 'rocky' surfaces of the moon and Mercury and H2O, H2 and O2 'atmospheres' about icy outer-solar system bodies. Since theses bodies contain other surface materials, direct detection by spacecraft or remote detection by telescopes of the desorbed atoms and molecules can be used, along with laboratory data, to determine the surface composition and geological processes occurring on distant bodies. This paper describes the relevance of stimulated desorption to the ambient neutrals and plasma in Saturn's magnetosphere, in preparation for CASSINI's arrival, and to the production of atmospheres on the moons of Jupiter being studied by the Galileo spacecraft. The samples collected during the Apollo missions show the lunar surface is modified by the impacting solar-wind ions (~ 1 keV/u H+ and He++) and by energetic solar particles (Taylor, 1982). This aspect of planetary physics has recently been revived by the observation of Na and K 'atmospheres' around Mercury and the Moon (Potter and Morgan, 1985; 1988). Such atmospheres are produced by stimulated-desorption (the ions, electrons and UV photons) of these atoms from the rocky surfaces (Madey et al. 1998). The sodium atmosphere has been seen to extend to ~ 5 lunar radii from the moon's surface (Flynn and Mendillo, 1993), providing an impressive manifestation of desorption. are essentially the minimum B contours that are similar to Acuiia et aZ. 's  calculations. acceleration of particles in a cyclotron[S elesnick, 19901.
plasma path lengths along field lines. plasmasphere might be larger than the above estimate of at 3 RN. 19931, and aurora in association with W emissions [Puranicasa nd Cheng, 19941.
discussion and conclusions are given in section 5. Uranus to determine if it has a plasmasphere. of plasmaspheric plasma to be a poor assumption. 4.5 RN on the zero magnetic scalar potential surface. also contribute to the measured bulk plasma parameters. high nondipole magnetic components, particles very near the planed to not execute complete 360"
drifts, similar to Acuiia et aZ. 's E19931 results given on the minimum B contours. Energetic 90"
surface, providing an alternate explanation for Paranicas and Cheng's [ 1 9941 "monoprecipitation." terrains suggesting that it may have been totally disrupted in the past and put back together at random—steals the show. geysers spew high into its tenuous atmosphere. Courtesy of NASA/JPL. 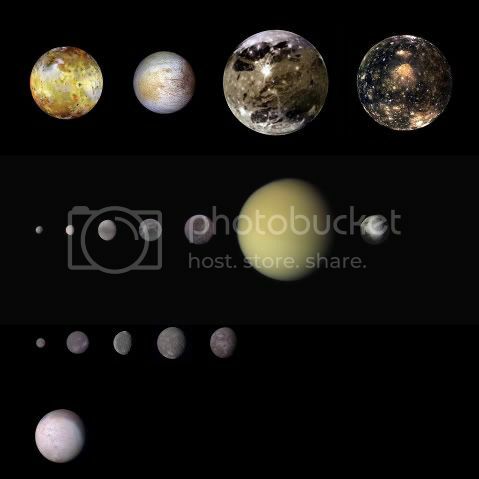 Pluto and two are larger than Mercury; in addition, there are 11 medium-sized satellites (Figure 5.1; Table 5.1). • Triton has active, geyserlike eruptions. unique worlds, and they may provide essential information about the origin and evolution of satellite systems. WHY DO WE CARE ABOUT LARGE SATELLITES? and satellite systems, some of which may be abodes for life. These oxidants could fuel life in the absence of sunlight. interaction are closed in the ionosphere of Jupiter where they generate visible footprints (see Figures 4.3 and 4.4). wind, in which magnetic reconnection plays a key role. at some time in their evolution. magnetic signatures are consistent with the presence of subsurface electrically conducting shells in these bodies. electromagnetic induction from geologically inactive Callisto was indeed a surprise. induction signature, so magnetic measurements cannot yet speak to the question of an ocean within Titan. much more accessible for detailed study than are extrasolar planetary systems. greatest potential for finding life, because the subsurface water may interact with the surface and the silicate mantle. surface. Titan may enable study of the conditions leading to the origin of life. As a bonus to science, researchers Marcus Knudson, Mike Desjarlais, and Daniel Dolan discovered a triple point at which solid diamond, liquid carbon, and a long-theorized but never-before-confirmed state of solid carbon called bc8 were found to exist together. When the comet Shoemaker-Levy 9 hit Jupiter sixteen years ago, scientists all over the world were prepared: instruments on board the space probes Voyager 2, Galileo and Ulysses documented every detail of this rare incident. Today, this data helpsThe "dusty snowballs" leave traces in the atmosphere of the gas giants: water, carbon dioxide, carbon monoxide, hydrocyanic acid, and carbon sulfide. These molecules can be detected in the radiation the planet radiates into space. In February 2010 scientists from Max Planck Institute for Solar System Research discovered strong evidence for a cometary impact on Saturn about 230 years ago (see Astronomy and Astrophysics, Volume 510, February 2010). Now new measurements performed by the instrument PACS (Photodetector Array Camera and Spectrometer) on board the Herschel space observatory indicate that Neptune experienced a similar event. 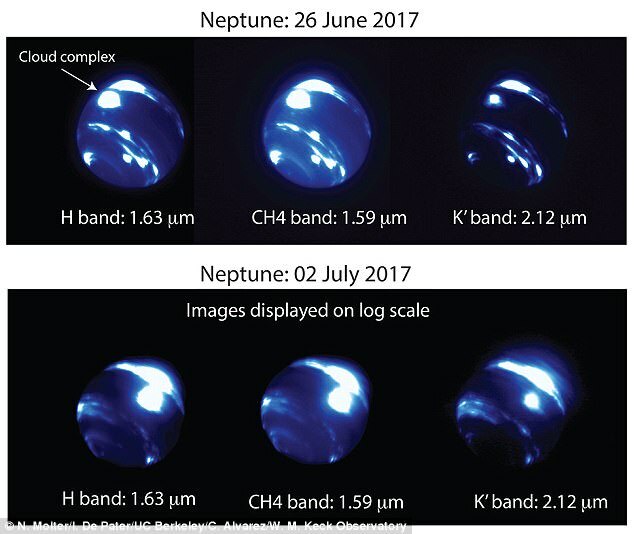 For the first time, PACS allows researchers to analyze the long-wave infrared radiation of Neptune. The atmosphere of the outer-most planet of our solar system mainly consists of hydrogen and helium with traces of water, carbon dioxide and carbon monoxide. Now, the scientists detected an unusual distribution of carbon monoxide: In the upper layer of the atmosphere, the socalled stratosphere, they found a higher concentration than in the layer beneath, the troposphere. "The higher concentration of carbon monoxide in the stratosphere can only be explained by an external origin", says MPS-scientist Paul Hartogh, principle investigator of the Herschel science program "Water and related chemistry in the solar system". "Normally, the concentrations of carbon monoxide in troposphere and stratosphere should be the same or decrease with increasing height", he adds. The only explanation for these results is a cometary impact. Such a collision forces the comet to fall apart while the carbon monoxide trapped in the comet’s ice is released and over the years distributed throughout the stratosphere. "From the distribution of carbon monoxide we can therefore derive the approximate time, when the impact took place", explains Thibault Cavalié from MPS. The earlier assumption that a comet hit Neptune two hundred years ago could thus be confirmed. A different theory according to which a constant flux of tiny dust particles from space introduces carbon monoxide into Neptune’s atmosphere, however, does not agree with the measurements. 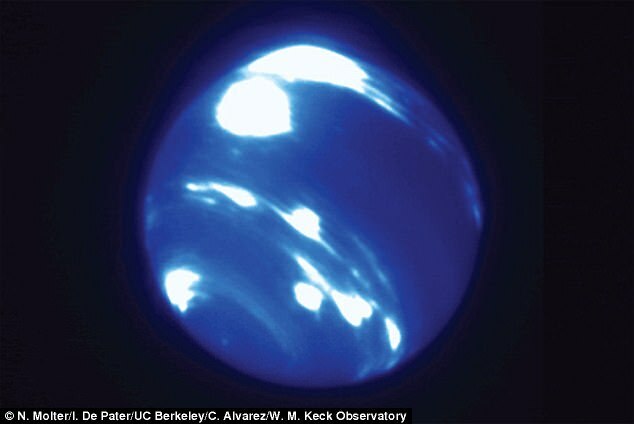 In Neptune’s stratosphere the scientists also found a higher concentration of methane than expected. On Neptune, methane plays the same role as water vapor on Earth: the temperature of the socalled tropopause - a barrier of colder air separating troposphere and stratosphere - determines how much water vapor can rise into the stratosphere. If this barrier is a little bit warmer, more gas can pass through. But while on Earth the temperature of the tropopause never falls beneath minus 80 degrees Celsius, on Neptune the tropopause's mean temperature is minus 219 degrees. Therefore, a gap in the barrier of the tropopause seems to be responsible for the elevated concentration of methane on Neptune. With minus 213 degrees Celsius, at Neptune’s southern Pole this air layer is six degrees warmer than everywhere else allowing gas to pass more easily from troposphere to stratosphere. The methane, which scientists believe originates from the planet itself, can therefore spread throughout the stratosphere. blobs of material that rise from depth and penetrate through a surface layer. This suggests that Triton's crust is layered. Some of the smooth deposits at right may be volcanic in origin. Plumes (or Geysers) One of the biggest surprises about Triton was the discovery of atmospheric plumes in the spotted southern hemisphere of Triton. These plumes reach heights of 8 kilometers and are blown laterally by winds in the extremely thin atmosphere (!). They can be traced for several hundred kilometers. The origin of these plumes is still a matter of debate. They may be the result of solar heating of a thin frozen nitrogen layer, or of melting of volatiles near the surface by internal heat. Hubble also spied two small satellites, named Mab and Cupid. One of the satellites shares an orbit with the outermost of the new rings. The satellite is probably the source of fresh dust that keeps replenishing the ring with new material knocked off the satellite from meteoroid impacts. Without such replenishment, the dust in the ring would slowly spiral in toward Uranus. Collectively, these new discoveries mean that Uranus has a youthful and dynamic system of rings and moons. "We think that dusty rings in general are sustained by impacts," de Pater said. "The rings of Jupiter exist because small meteorites continuously bombard the moons in Jupiter's system." Study co-author Heidi Hammel of the Space Science Institute in Ridgefield, Connecticut, added that Uranus has been "the unappreciated underdog of the outer solar system for too long. "It is refreshing to see such dynamic change and exciting evolution in the rings and the planet." Thrill seekers may want to hitch a ride on the giant comet Hale-Bopp, but they would fail vehicle emission tests miserably. When it was the same distance from the Sun as Earth, Hale Bopp produced carbon monoxide (CO) emissions equal to that given off by 5.5 billion cars every day. The highest concentration of carbon dioxide, however, has shifted away from the latitude of the impact. It is most prevalent poleward of 60 degrees south and decreases abruptly, toward the equator, north of 50 degrees south. Another smaller spike in its presence occurs at high northern latitudes, around 70 to 90 degrees north. Perhaps the two chemicals got distributed at different altitudes, and are being moved around by different currents, Flasar told SPACE.com. Or maybe the formation of the carbon dioxide was more complex than thought. He said it might have involved carbon monoxide first moving away from the impact area and then interacting with other substances at higher latitudes before being converted to carbon dioxide. Still I think, although I couldn't quite trace the argument shooting down the influx from outside-hypothese, that there is is room for sputtered material migrating from for instance Triton to flow and seed the stratosphere of Neptune. I think it proves that these scientists are not required to sit in the same rooms with each other and talk, read each other's work, or in any other way attempt to stay current with other discoveries in not only other disciplines, but with the work that others are doing with the same satellite! One guy is adamant about this material only being able to be brought in via the 'Comet Express', while others are taking measurements on the amount of sputtered material they are observing transiting the two bodies... rediculous. Yet- even the guys who are measuring the material being sputtered off the moons is careful to avoid mentioning HOW sputtering occurs in the first place! Voyager 2 arrived at Neptune during the maximum of solar cycle 22 now, as solar activity approaches solar minimum atmospheric activity is increasing on Neptune 2.8 billion miles away! Is Neptune intercepting more galactic electrons headed toward the Sun? "Astronomers have observed a gigantic storm on Neptune so big it covers an area the size of Earth while testing a telescope on Hawaii. "The huge storm is about 9,000 kilometres in length, or one-third the size of Neptune's radius. It spans at least 30 degrees in both latitude and longitude, and was spotted during a dawn test run of a Hawaii observatory. "While observing Neptune at dawn with the Keck Telescope, the nearly circular storm system near Neptune's equator, a region where astronomers have never seen a bright cloud, was spotted. The centre of the storm complex is 9,000 km across, about 3/4 the size of Earth, or 1/3 of Neptune's radius. "The test was designed to test if telescopes could still provide useful information during twilight. "Traditionally, astronomers wait until dark to begin observations. "'Seeing a storm this bright at such a low latitude is extremely surprising,' said Ned Molter, a UC Berkeley astronomy graduate student, who spotted the storm complex near Neptune's equator during a dawn test run of twilight observing at W. M. Keck Observatory on Maunakea, Hawaii. "This massive storm system was found in a region where no bright cloud has ever been seen before. "Researchers observed it getting much brighter between June 26 and July 2. "'Historically, very bright clouds have occasionally been seen on Neptune, but usually at latitudes closer to the poles, around 15 to 60 degrees north or south,' said Imke de Pater, a UC Berkeley professor of astronomy and Molter's adviser. "Images of Neptune taken during twilight observing revealed an extremely large bright storm system near Neptune's equator (labelled 'cloud complex' in the upper figure), a region where astronomers have never seen a bright cloud. The centre of the storm complex is ~9,000 km across, about 3/4 the size of Earth, or 1/3 of Neptune's radius. The storm brightened considerably between June 26 and July 2, as noted in the logarithmic scale of the images taken on July 2. "At first, de Pater thought it was the same Northern Cloud Complex seen by the Hubble Space Telescope in 1994, after the iconic Great Dark Spot, imaged by Voyager 2 in 1989, had disappeared. "But de Pater says measurements of its locale do not match, signaling that this cloud complex is different from the one Hubble first saw more than two decades ago. "A huge, high-pressure, dark vortex system anchored deep in Neptune's atmosphere may be what's causing the colossal cloud cover. "As gases rise up in a vortex, they cool down. "When its temperature drops below the condensation temperature of a condensable gas, that gas condenses out and forms clouds, just like water on Earth. "NASA's Voyager 2 spacecraft gave humanity its first glimpse of Neptune and its moon Triton in the summer of 1989. This picture of Neptune was produced from the last whole planet images taken through the green and orange filters on the Voyager 2 narrow angle camera. The picture shows the Great Dark Spot and its companion bright smudge; on the west limb the fast moving bright feature called 'Scooter' and the little dark spot are visible. "On Neptune we expect methane clouds to form. "As with every planet, winds in Neptune's atmosphere vary drastically with latitude, so if there is a big bright cloud system that spans many latitudes, something must hold it together, such as a dark vortex. "Otherwise, the clouds would shear apart. "'This big vortex is sitting in a region where the air, overall, is subsiding rather than rising,' said de Pater. "If it is not tied to a vortex, the system may be a huge convective cloud, similar to those seen occasionally on other planets like the huge storm on Saturn that was detected in 2010. "Although one would also then expect the storm to have smeared out considerably over a week's time. 'This shows that there are extremely drastic changes in the dynamics of Neptune's atmosphere, and perhaps this is a seasonal weather event that may happen every few decades or so,' said de Pater."